In a business where size matters more than ever, two of the smaller owners of cable TV channels are getting bigger together. Discovery Communications, which owns TLC and Animal Planet, is acquiring Scripps Networks, which owns Food Network and HGTV, in an $11.9 billion deal. "Together, we're about 20% of the viewership on cable, and we're at the very top of the list in quality," Discovery CEO David Zaslav told CNNMoney in a phone interview Monday morning. The deal is predicated on a belief that channel owners like Discovery need more muscle in negotiations with TV distributors in the United States. Zaslav also said the deal will benefit Discovery's growing international businesses. Food Network and HGTV shows like "Chopped" and "Fixer Upper" have audiences that skew toward women, and Discovery operates channels in dozens of countries where some of the shows would fit. "We think we can take that content to our female platforms around the world," Zaslav said. The deal has been in the works for several weeks. Viacom also pursued Scripps but backed out of the bidding war last week. Zaslav and Scripps Networks CEO Ken Lowe grew up in the cable business together and have been friends for three decades. They last talked about a deal in 2013. In the years since, the cable business has come under increased pressure from online players like Netflix and YouTube. Channel owners have been challenged to prove that they have must-see, must-carry programming, lest they risk losing distribution. Those channel owners don't want mere viewers, they want "super-fans" -- "people who aren't tuning in because they like you, but are tuning in because they LOVE you," as Zaslav put it on Monday morning. He added: "One of the questions we ask ourselves is, 'What kind of content do we have that people will watch when they can watch anything, or pay for before they pay for dinner?'" 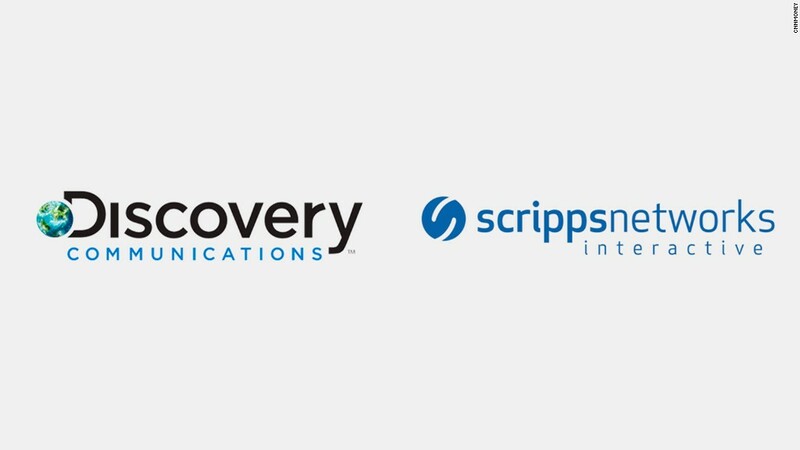 Discovery and Scripps (SNI) have pursued a similar strategy of owning, not just licensing, the shows on their channels. This could give the combined company a leg up. When the talks were reported earlier this month, some prominent Wall Street analysts said they were skeptical of the benefits of a Discovery-Scripps deal. It remains unclear whether the combination will help Discovery get more of its shows in programming packages being sold by YouTube, Hulu and other online distributors. But that's part of the goal. In a statement, Lowe cited opportunities with "new and emerging channels including short-form, direct-to-consumer and streaming platforms." Along with HGTV and Food Network, Scripps operates DIY and the Cooking Channel. Both Scripps and Discovery have growing web video businesses, but television remains the dominant profit driver. Monday morning's deal is valued at $14.6 billion, or $90 per share, counting Discovery's assumption of Scripps' debt. Scripps stock was trading at about $67 per share before the deal talks were reported in the press. It closed Friday at $86.91. The combination will be reviewed by regulators. Discovery and Scripps said it is "expected to close by early 2018." At that time, Lowe will join Discovery's board of directors.